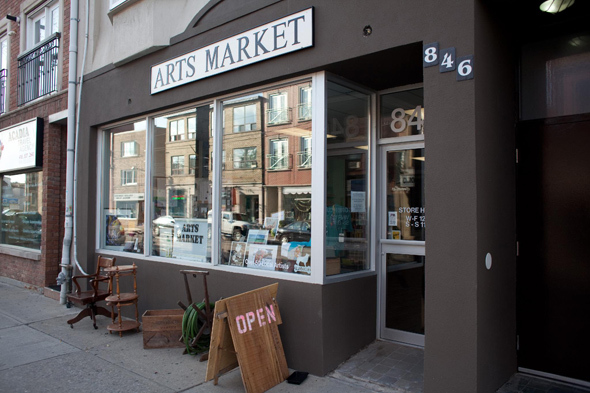 An Arts Market has opened on College Street. Yes, west-end artists and shopping enthusiasts - good news! 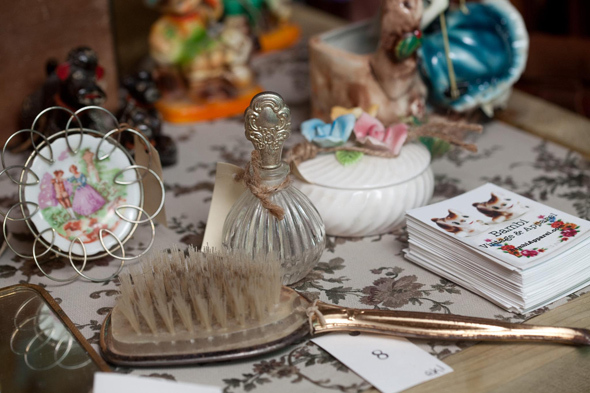 Leslieville's Arts Market recently opened a second location on College just west of Ossington. 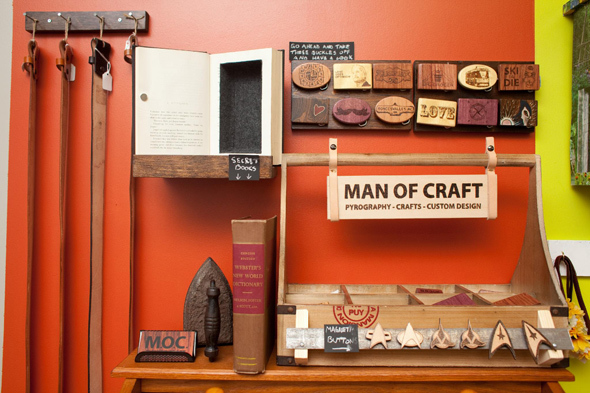 This market is a one-stop shop for original artistic creations of all kinds, as well as antiques, handmade bath products, vintage goods, and more. 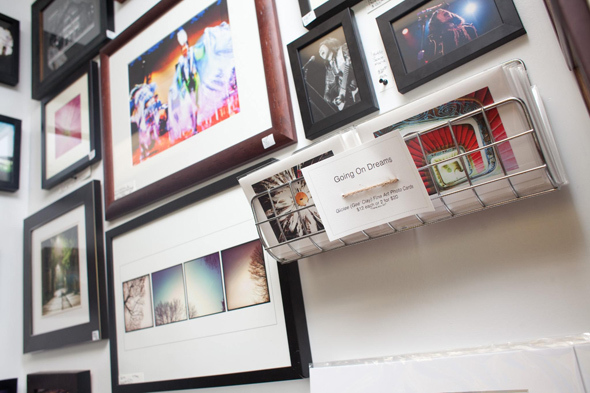 Owner Daniel Cohen started the Arts Market two years ago to provide an economical retail space for local artists to build a customer base and sell year-round. They can rent space in the market for four weeks or more without paying any commission. Evidently, Toronto's artists approve of Cohen's business model. He opened the second College Street location due to overwhelming demand for a spot in the Leslieville store. 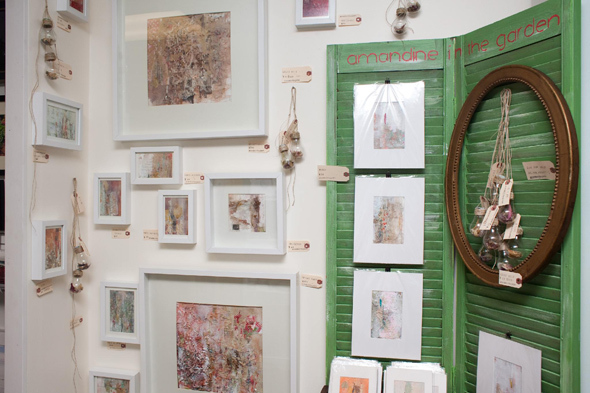 The market is not only great for artists and artisans, but shoppers too. It's hard to believe that the bright and spacious new store is home to over 50 different vendors. The wide assortment of colours, textures, and shapes are a feast for the senses, and I couldn't walk by a booth without stopping for a closer look. Cohen says he's had great feedback from locals who are happy they now have a place to pick up unique gifts and handmade creations. As a nearby resident, I'd agree. I had to exercise considerable self-restraint during my visit as I kept spotting great gift ideas--for loved ones, sure, but mainly for myself. 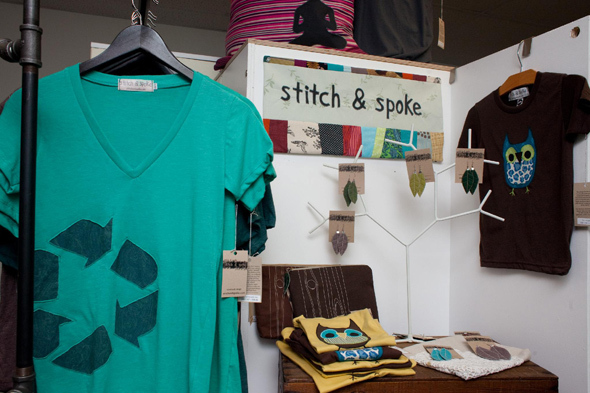 Jody Leigh McMillan's clothing designs turn a dietary restriction into a fashion statement. Men's and women's t-shirts come with cheeky statements that celebrate gluten free living, like "oats? totes!" and "g f yourself," and have the soft feel of your favourite old tee ($45). As an added incentive to pick one up, a portion of the proceeds are donated to the Canadian Celiac Association. Arts Market owner Daniel Cohen describes Adam Grant as a "good, solid guy, who's creative and just wants to craft." Well, thanks to Grant, craftiness never looked so manly. He uses wood in rich natural shades to create belt buckles, bottle openers, and pins with designs that pay homage to Toronto's neighbourhoods, iconic images, and historical figures. I'm sure we all know someone who would love to see Jack Layton or Sir Isaac Brock looking on approvingly from atop their bottle opener as they crack open a cold one. Bottle openers are $50, belt buckles are $20-$50, and pins are $5-$10. 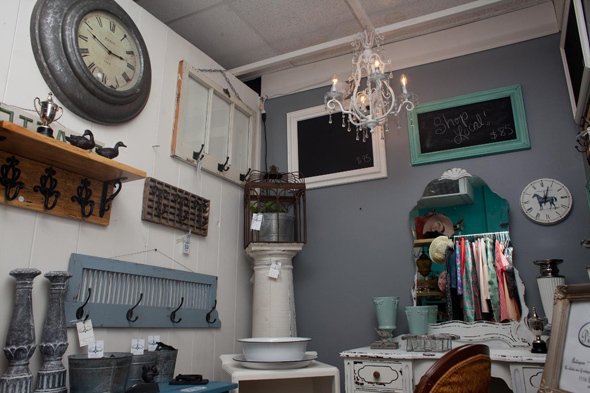 Antique lovers on the west side can now discover some of Pied-a-terre's treasures without making the voyage out to the Leslieville store. These French-inspired antiques, furnishings, and accessories are perfect for creating a casual worn-in elegance in your home. Perusing the display, I found myself mentally redecorating my apartment to incorporate a crystal Eiffel Tower vase ($30), a distressed Wedgwood blue dresser ($395), and a gently rusted iron bird cage ($95). And no, I don't have a bird. Linda Varekamp's colourful t-shirts, baby onesies, pillow coverings and earrings feature recycled fabrics and are made entirely of free-hand machine stitching, so each one is a bit unique. She uses applique and embroidery techniques to create fun images so you can easily put a bird on it (or a Buddha, or a bike, or a recycling logo, to name a few designs). Women's and men's tees are $45-$55. French artist Amandine Rufin resides in Toronto and uses mixed materials like fabrics, dried plants, and printed text to evoke memories and reflections on the nature of time. I spent several moments peering into each beautiful collage to uncover the delicate layers of faded paint, torn lace, newsprint, and old stamps ($20-$30 for cards, and $40+ for framed collages). Bambi Vintage Apparel offers an impressive array of women's vintage clothing, accessories, and knickknacks from its corner of the Arts Market. I couldn't help leafing through old Life Magazines from 1957 (originally sold for 20 cents, and now sold for $14) and checking out a great needlepoint purse that reminded me of my grandma's dining room chairs ($48). I'll probably return for one of the faux-pearl and pendant necklaces in the near future ($10-$18). Sarah Podemski's stand in the Arts Market has a soft and feminine feel, but take a closer look to discover jewelry that is both delicate and a bit edgy. 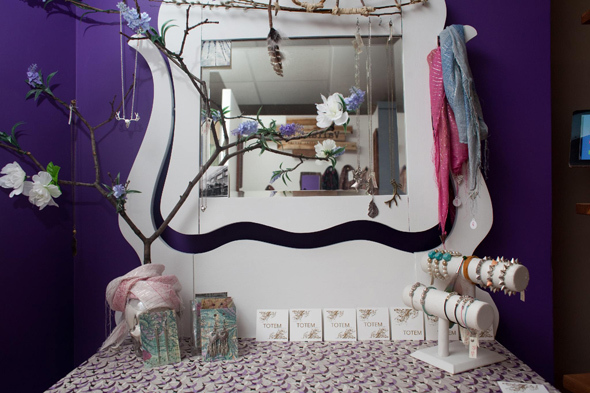 Pendants in the form of human and animal skulls, antlers and leaves adorn long metallic chain necklaces ($15-$20), while Podemski's bracelets combine soft pastel colours with metallic skulls and spikes ($10-$15). Jason Jenkins' photography celebrates the hidden beauty and fascinating visual contrasts found in daily urban life. His pieces showcase famous Toronto landmarks and ordinary settings alike, as well as dramatic scenes from the Idle No More protests. Photo cards are $12, unframed prints are $65, and framed prints are $40-$195. A scented candle may not sound like a terribly original gift idea, but these ones have a unique and personal touch. 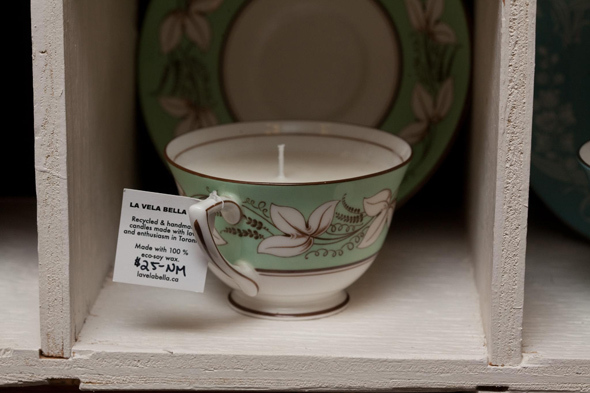 La Vela Bella makes scented soy wax candles in recycled tea cups, pottery, camping mugs, saucers and antique mason jars ($10-$40). For cottage owners or guests looking to repel mosquitoes in style, check out the antique mason jar citronella candles. The Arts Market on College Street is open 12-7 Wednesdays to Fridays, and 11-7 on Saturdays and Sundays.